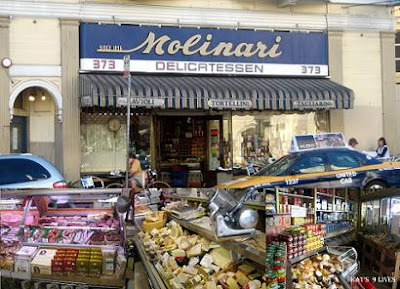 Kat's 9 Lives: Molinari Delicatessen : Prosciuttos Galore! Molinari Delicatessen : Prosciuttos Galore! Ms. Lin and I were looking for new places to try and she had happen to come upon Molinari Delicatessen online. It's usually not our type of place but we wanted to head out and give them a try. 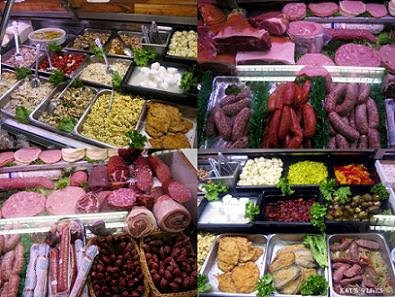 They have a nice selection of cheeses, meats, and prepared food. It's a really tiny market packed full of delightful products. I guess we were able to beat the crowd and grabbed a number before it started getting busy. Be sure to grab the number as soon as you enter. There are plenty of staff members behind the counter that are eager and willing to help. They are all very friendly and knowledgeable. There was so many meats staring us in the face that we had to succumb to our desires and pick some up for home. It's not like we ever eat at home or have time to finish all the food, but we just got to have some! ^_^ I guess our sin is gluttony. We asked the guy some questions about the meat and he immediately sliced some pieces for us to try. Then we asked him the perfect question, which Salami was the best. He immediately lit up and sliced us up a few more pieces to try. We decided to get 1/2 lb. for home. The people who work here are truly professionals. All the slices were so delicately and precisely sliced. It's almost like a work of art! Great review Kat! 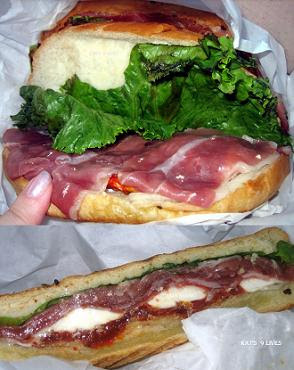 I love Italian deli meat and your pictures had me drooling. Luce : An Incredible Night Of Fine Dining! French Laundry : I Finally Got In! Did I See Fleur de Sel? Chung King Restaurant : Yowzer! Spicy!!! Mon Land Hot Pot City : Where's My Ma-La Hot Pot?